When it comes to figuring out how to start a blog, I’m all about getting help. Maybe you can relate! Does the process of starting a blog seem overwhelming? Don’t worry. I’ve got your back. We’ll get through this together! You see, I’m totally NOT a techie. I understand my “zone of genius” and it’s never been anything in the technical arena. I have a full schedule of client work, as well as developing my own websites. So, I outsource for the technical part. 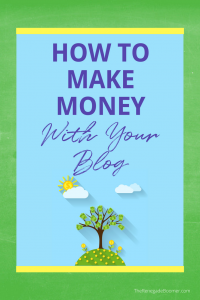 My focus and expertise is teaching you all the marketing and copywriting strategies you’ll need to start making money with your blog. Yay! But for this part? Time to call in an expert. That’s what I do when I build a new website, and that’s exactly what I’m doing now! My trusted colleague and web wizard is Roxanne Ray Materese. She’s my go-to for all things web related, as well as someone I’ve collaborated with on a number of complex client projects. And if you ever need a killer Facebook Ad Campaign? Roxanne’s the woman for the job! I’m all about transparency and being real with everything on The Renegade Boomer. So, I wasn’t about to take this on myself. 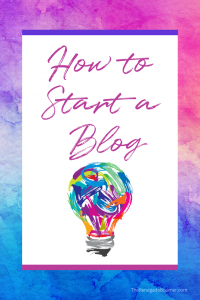 But I also knew I wanted a really focused, easy to understand step-by-step guide for how you can start a blog. I want you to succeed, not get bogged down. Clearly, there was only one thing to do. I asked Roxanne to write a guest post for me, and oh my goodness, did she ever deliver! If you’re like me, you’ll appreciate the clear instructions and illustrations Roxanne provides. So, don’t put off starting a blog because you’re not sure how to begin. Just follow the yellow brick road Roxanne lays out for you right here, and you’ll be blogging in no time. I’d suggest you open a second browser window as Roxanne suggests in her post, and just take it step by step, right along with her. 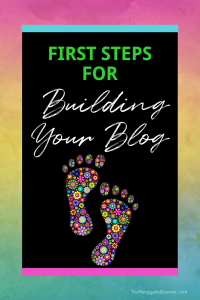 I’ve personally coached a number of new bloggers who had no idea about blogging until they began working with me…and they had their blogs up and running the very same day, just by following the simple instructions! You can do it too. Have you ever searched Google for “the first blog post ever”? I was curious to see what it looked like, and heck even what year it was first created. What’s interesting is blogging evolved very similarly to the way social media has evolved. Remember when your friends used to simply post their daily activities on MySpace or Facebook, basically giving us an online diary of their life? Well that’s exactly how blogging started as well. Apparently, the term BLOG came from the original term weblog coined back in 1997! And the first “blog” was started in 1994 by a college student documenting his life. That was over 20 years ago. Pretty neat, huh? It is fairly easy to create a blog these days and make it live on the “world wide web”, as it was first called back in the 1990s. Back then you had to know a lot more technical jargon, not to mention having to use a dial-up service to connect to the internet. Yikes! The first step in creating your blog is determining which platform to build it on. WordPress is widely accepted and it is the platform I’ll be walking you through today. Most people get confused by WordPress when they first start. Mainly because there are actually TWO versions of WordPress. The free one and the paid one. Well that’s not exactly accurate either. They are both free, however one you must pay a modest fee in order to self-host your WordPress blog. Why would you pay to host something that is free? Because you are not allowed to put affiliate links or any monetization methods on the FREE HOSTED WordPress sites. Those features are reserved for the PAID HOSTED WordPress sites. 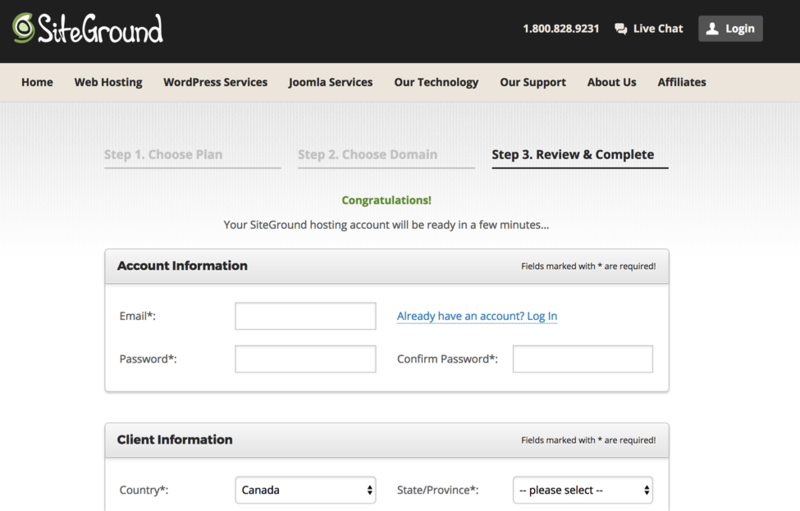 Since you are more than likely interested in creating a blog to generate an income, I highly recommend self-hosting your WordPress website through SiteGround. With the almost endless ways to make money blogging, your self-hosted fees through SiteGround will be paid for with ease. As a professional web designer, I have the inside scoop on all things websites. They are the least expensive with the BEST service and features. NOTE: I strongly recommend you stay away from any Hosting company that is owned or a subsidy of EIG. 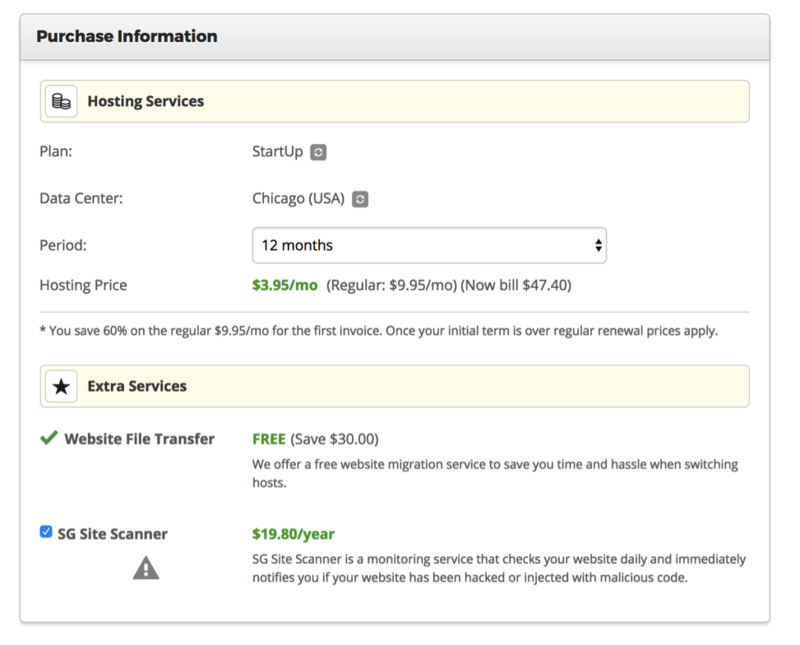 This includes Bluehost, HostGator, and more. They own over 65 hosting companies now. Their sites are always slow and go offline for days at a time. Not to mention terrible customer service and always trying to sell you something. I recommend starting with a Shared Hosting plan until you get a lot of website traffic. 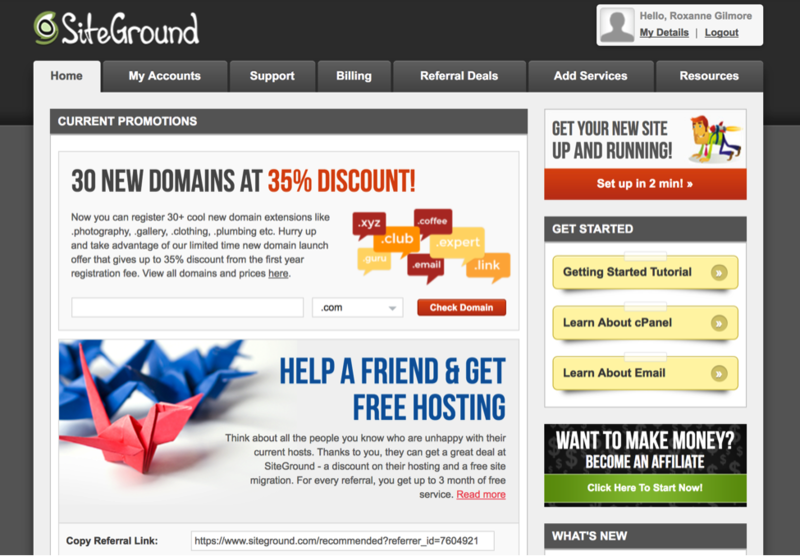 SiteGround’s shared hosting plans start at $3.95/month. Free SSL certificate – makes your website secure and encrypted. This has become essential and a MUST if you are collecting email addresses of your visitors – which you should be. Free Daily Backups! This is another MUST! There are no contracts so you can get a refund at any time. Click Here to start creating your blog as you follow along with these steps. 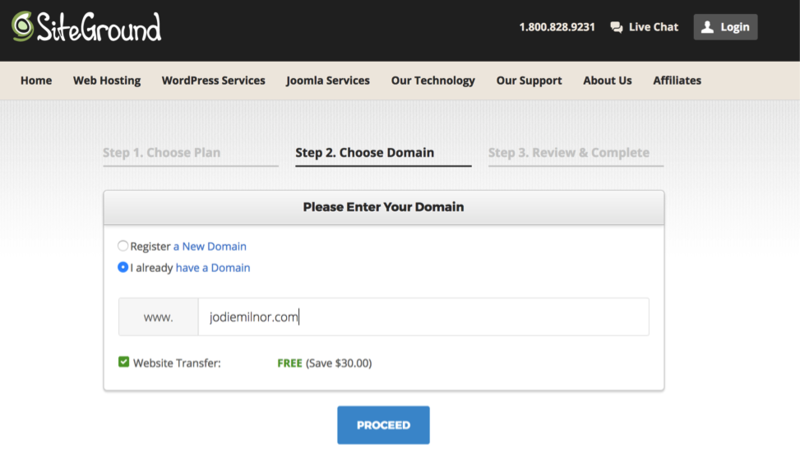 Purchase an inexpensive domain from NameSilo (starts at $1.89/year). I love NameSilo because they are the cheapest domain registrar out there AND they give you free Domain Privacy Protection. If you do not purchase Domain Privacy Protection through other domain registrar’s, your personal information will be available to scammers and your mailbox will fill up with junk! Search for the domain name that you would like to title your blog with. I always highly recommend people choose their full name as their domain name. This will allow you to become an authority in your chosen niche. However, if you want to blog anonymously then choose a different name. If you’re feeling flush, you may even want to buy several renditions of your domain name with some of the other extensions, so someone can’t create a website with a very similar domain to yours. Keep in mind your domain should be easy to remember, and easy to spell. This isn’t the time to get clever with weird combinations of words to create a domain. You’re not Twitter or Google, so keep your domain name in line with your niche market, clear, and understandable. NOTE: A Domain name can be registered with ANY company you choose. It does not have to be through your hosting company and is actually better to not have it through your hosting company in case you want to switch hosts. 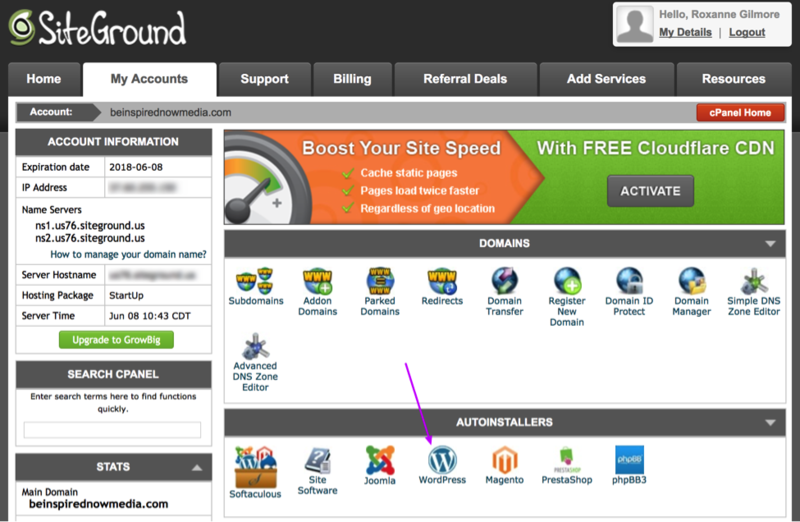 Click here to go to SiteGround to create your self-hosted account. 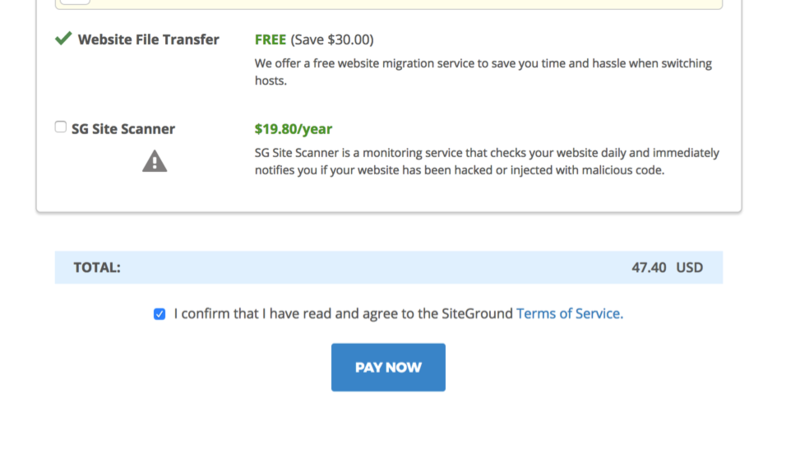 Once on SiteGround’s website – Click on the White “SIGN UP” Button on the bottom left of the screen. 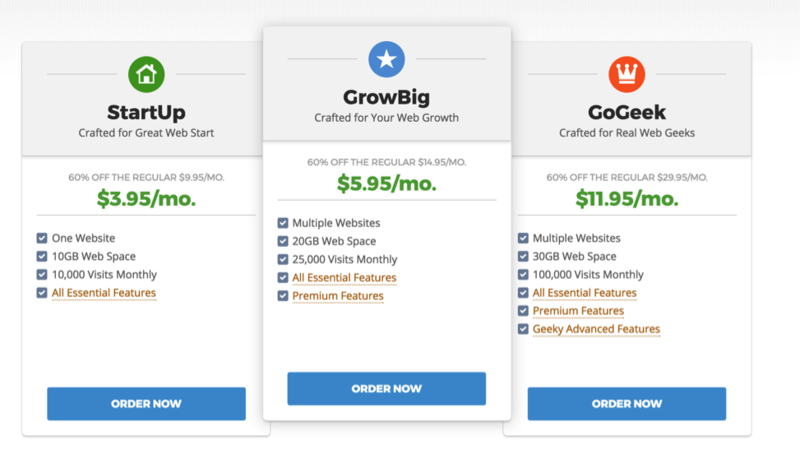 Choose the Startup Plan for $3.95/month. Click the blue “ORDER NOW” button. 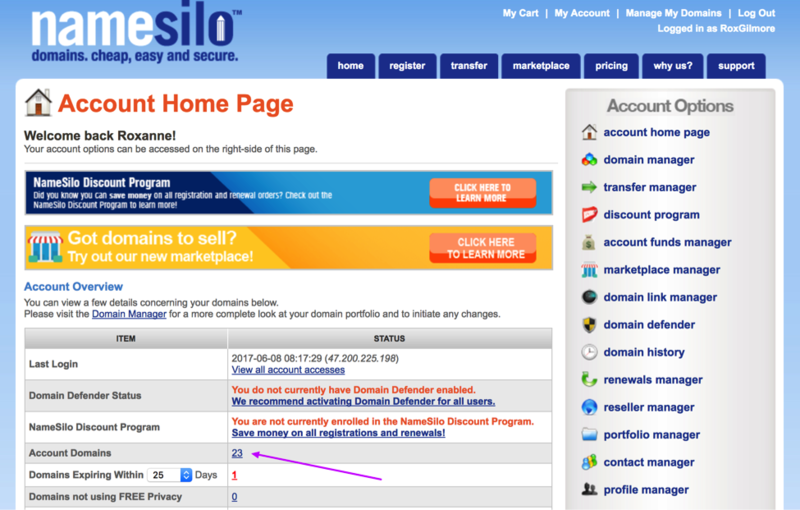 When you get to this screen, choose “I already have a Domain” and enter the domain you registered with NameSilo here. Click the blue “PROCEED” button when ready. Yay! You’re almost finished. Fill in your contact and billing details on this screen. When you get to this box, be sure to UNCHECK SG Site Scanner. There are MUCH less expensive malware and hacker monitors out there for your website. You’ll need to pay for the whole year in order to get the discounted price of $3.95/month. Just remember, they have a 30-day money back guarantee if you aren’t satisfied. When you’ve entered your information click the blue “PAY NOW” button. Make note of the Account DNS. Then click on Account Domains – the number next to it. 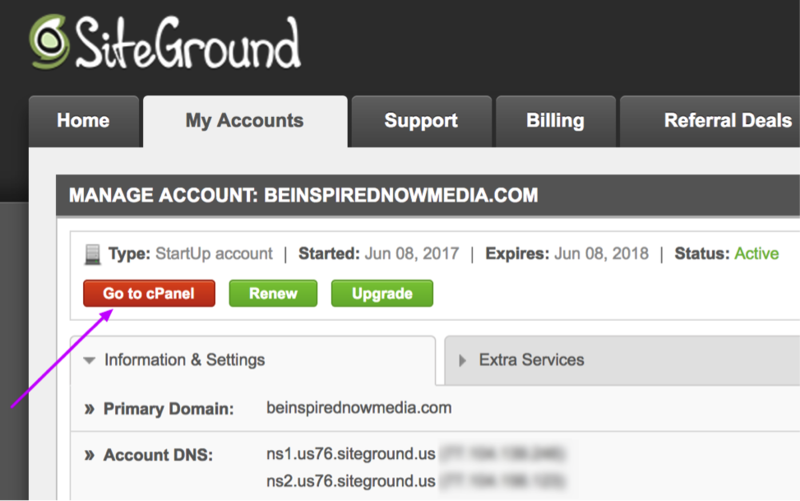 Then click on the Domain you purchased that you want to be hosted with SiteGround. This is where you’ll be updating the DNS records. 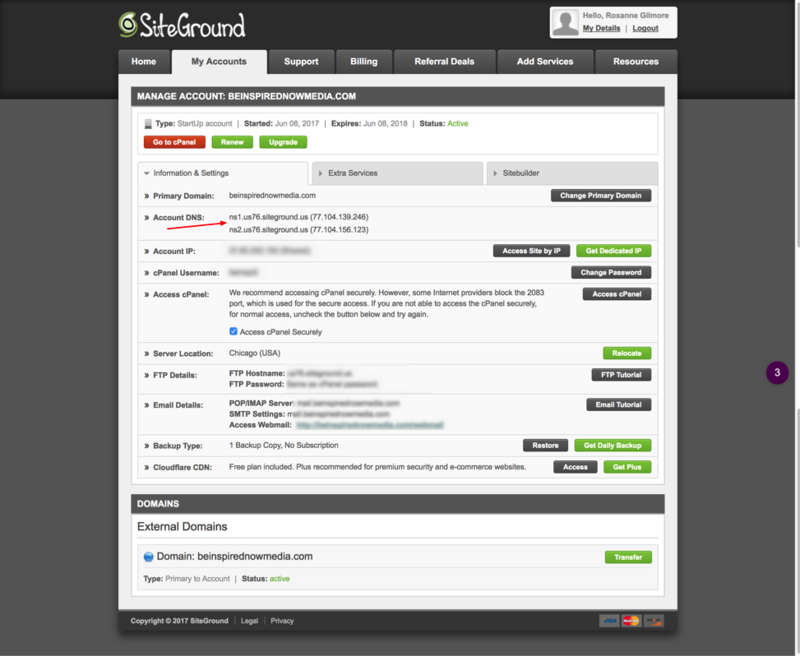 This tells NameSilo that you want that domain hosted with SiteGround. 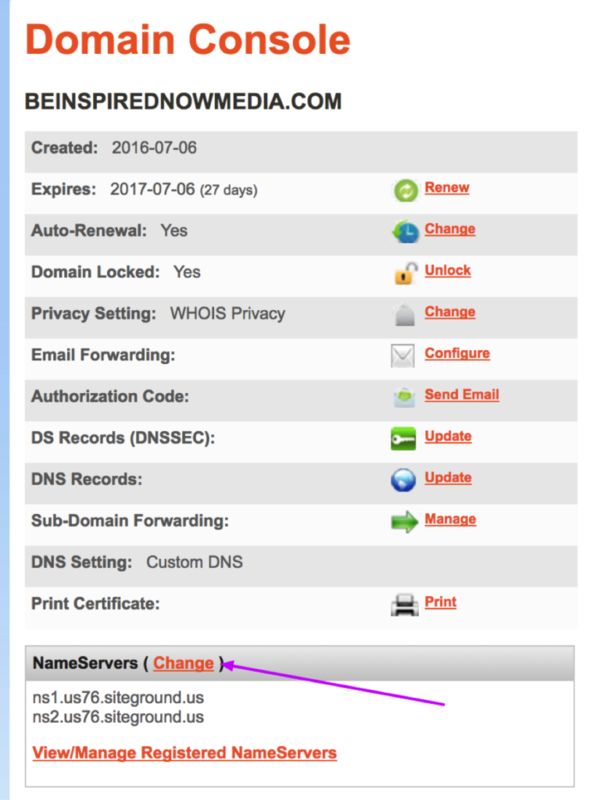 Click on Change next to NameServers. 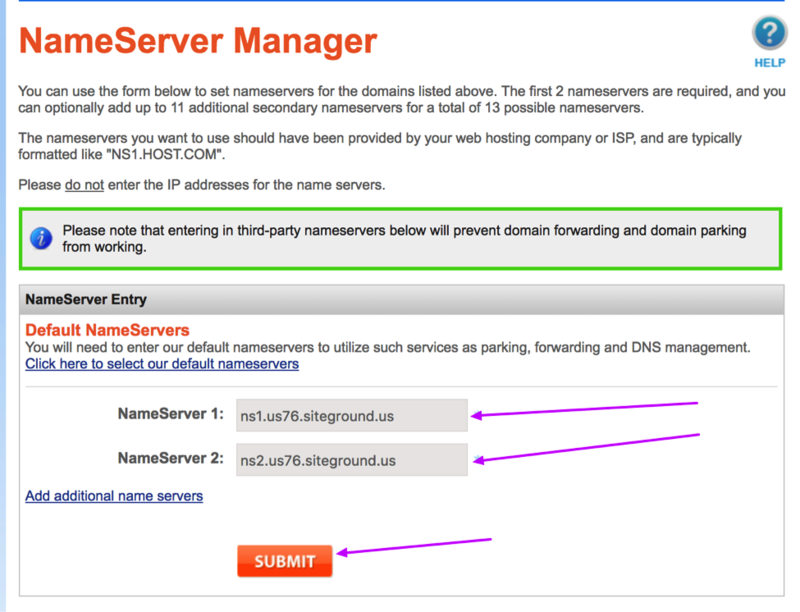 Update the Name Servers with what you saw in your SiteGround Account DNS. You’ll be taken here. 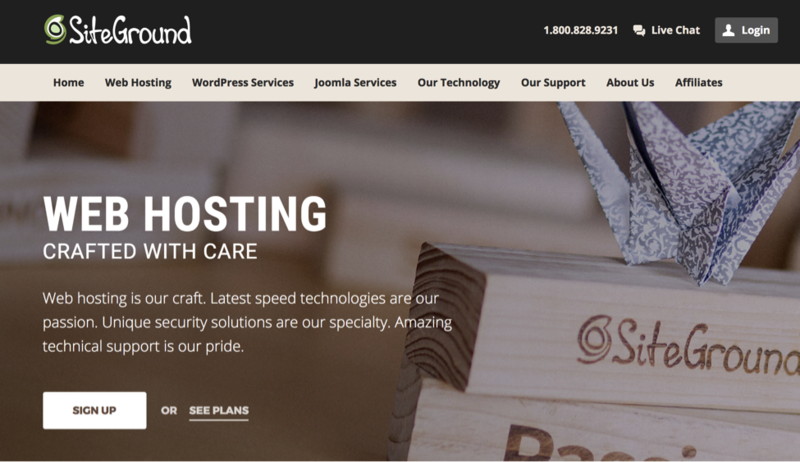 We will now install WordPress on your new website. 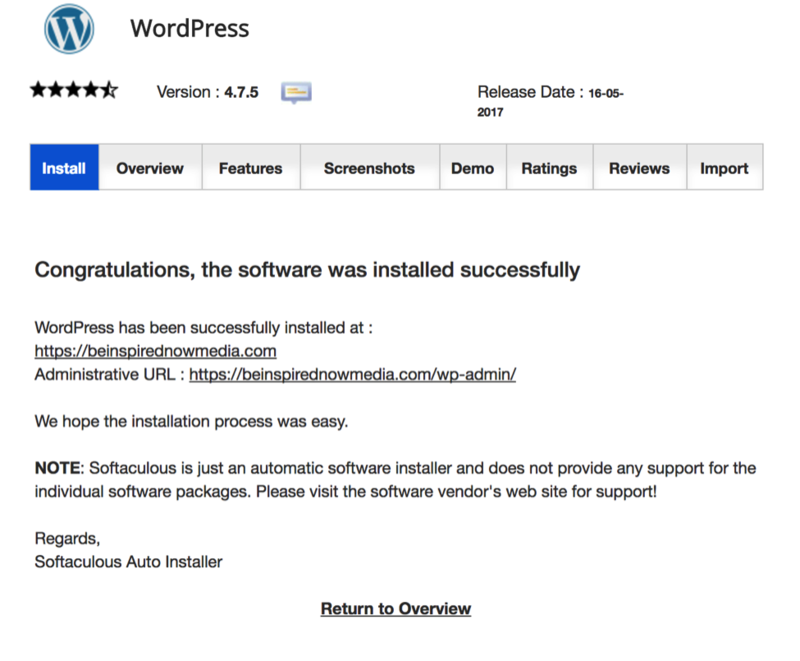 Click on WordPress under the Auto installers tab. Scroll down and click on Install Now. You’ll want to update the details here. 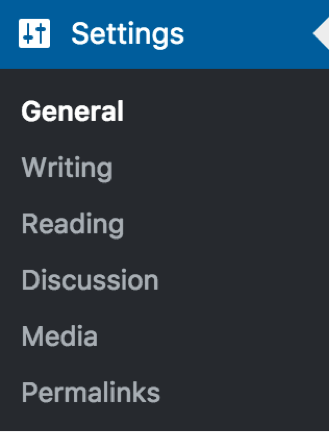 Site Settings – you can change these later so don’t get caught up on what to write. Admin Account – make note of these, or change them to your liking. I always change the Username to something that is unique to me and that I can remember. You can also change the email address. Make note of the password you used. This is what you’ll see after clicking Install. When it is finished, click on your Administrative URL. This is the URL you will get VERY familiar with. It is how you access the back end of your site to post blogs. Think of WordPress as the operating system of your website. You could easily operate a Microsoft computer using commands, but instead there is an operating system called Windows that makes it easy to navigate to your programs and the internet. That is what WordPress is. It’s the operating system of your blog. It allows you to easily manage the backend of your website. Without it, you would need to understand crazy complicated code that frankly isn’t necessary to learn (unless you want to be a coder). 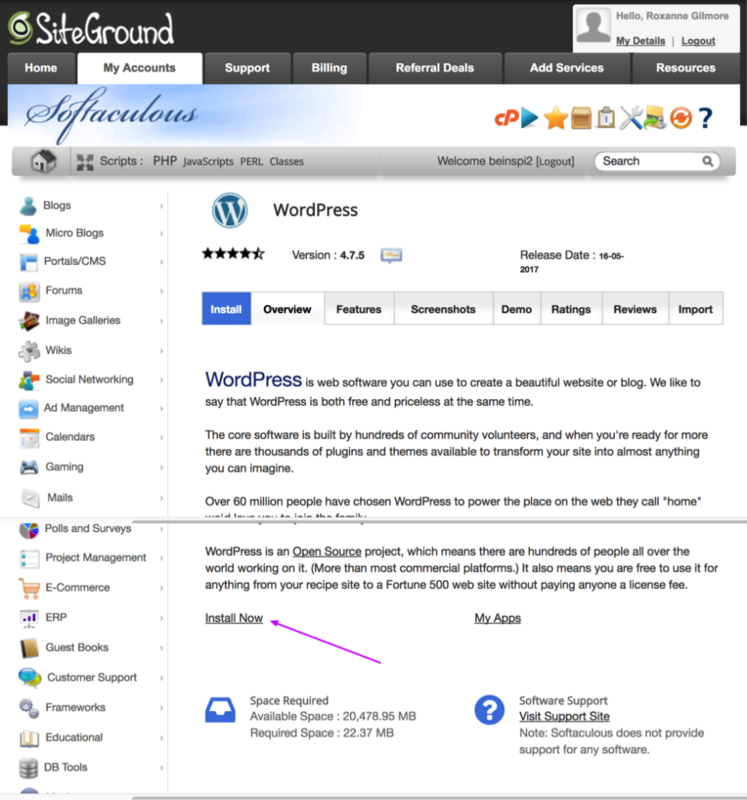 Here is what your WordPress home screen will look like. Take a moment to get familiar with it. Your blog posts will be posted under POSTS. MEDIA is where you will upload your images. PAGES are for things like your Home page, About Me, Contact – it’s for the static pages you won’t be touching much after you set them up. APPEARANCE is where you’ll adjust the design of your blog and upload themes you may purchase. USERS – you can add people to access your website. More than likely you won’t be using this unless you hire VAs or something similar. TOOLS – you won’t be using that much either. If you do use TOOLs, it will be for a very specific reason and you’ll have instructions on what to do. SETTINGS – let’s review this now. There are a few things I want you to adjust that will make your website/blog function that much better. 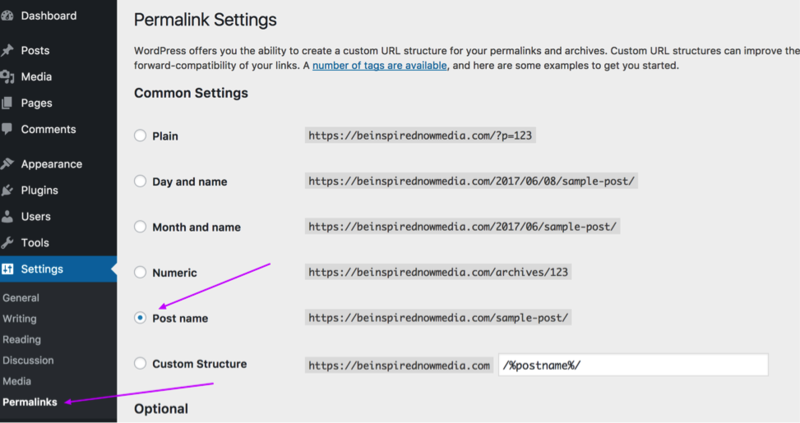 Permalinks – I want you to go in and change the Common Settings to Post Name. This is extremely important for SEO purposes. Now that you are familiar with the backend of WordPress website, you are probably wondering how do people make such pretty websites? Well, this is the fun part! Designing a website has never been easier. 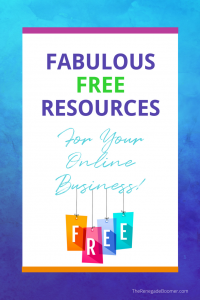 There are plenty of tools out there available to help you get your blog up and running quickly and have it looking professional. My advice is to first write out the content you want on your pillar pages. These are the pages that are not technically part of your blog. They will become part of your blog navigation. Once you have your pillar page content written, it’s time to figure out the design. You have FOUR options when it comes to designing your blog. Download a free WordPress theme. Buy a drag and drop visual builder for your blog. Hire a professional designer to design a theme for your WordPress Blog. Before I go into detail with each option, there are a few basic features you’ll want to make sure your theme/template/framework offers. Responsive Design – this means the theme will resize automatically depending on if you are checking it from an iPad, smart phone, laptop or desktop computer. Simple Navigation – don’t confuse your visitors! Go to https://justfreethemes.com/ to browse the free themes available today. These themes are great for someone on a budget just starting out. Just keep in mind, you will most likely upgrade to a paid theme at some point since the functionality of free themes can be very limiting. If you decide to go with a free theme, do NOT spend day and night looking for the best theme. Just pick one after a quick search and get to work! 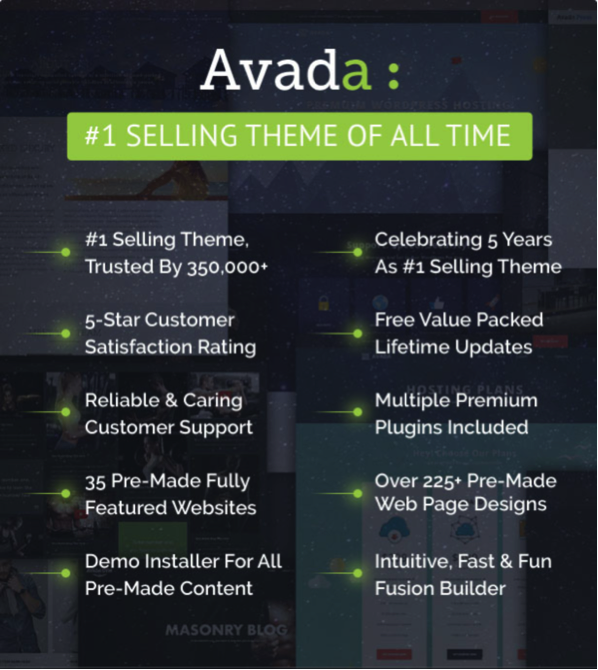 If you can afford a small investment into the design of your website, the Avada Theme is what I recommend. This theme is the most popular theme out there. It only costs $60 and meets all of the parameters laid out here for you. You can purchase it from Theme Forest here. If you want more freedom in the way your blog is laid out, I highly recommend a drag and drop visual builder. This is the “What you see is what you get” way of designing and is becoming very popular. They take just a little bit of getting used to, but gives you a wider range of features without the need to understand CSS (what websites are coded with). 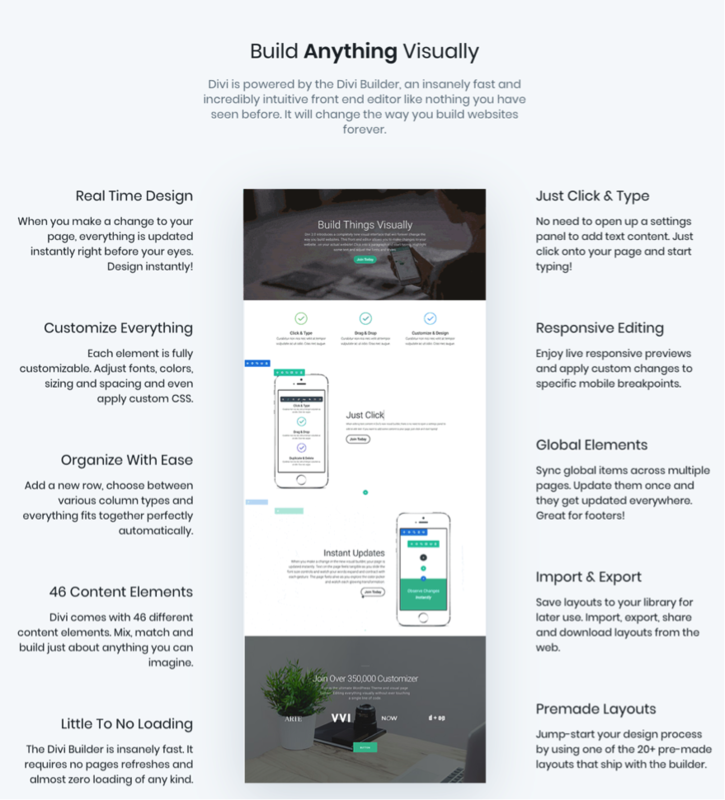 I personally recommend the Divi Builder as the best Drag and Drop Visual Builder on the market. The neat thing about Divi, is you can upload premade layouts and then customize them to your liking. There are actually quite a few free layouts you can find out there that are very stylish. There are 2 additional plugins you can purchase with your Divi Builder that will make customizing your blog a breeze. In addition, there are 2 Facebook Groups with a plethora of experts in them who can help answer any of your Divi related questions. Your final option is to hire a professional web designer. 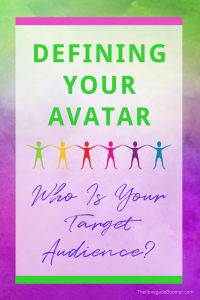 They will work with you to determine exactly what the purpose of your blog is and work to design a great looking website that can serve you well for many years to come. I highly recommend you install the following plugins on your website. I only recommend 4 paid plugins; the rest are free. I could write an entirely different post explaining these plugins to you. Just suffice to say that they are a must to help you with your WordPress’ functionality, security, and building a profitable blog. Free Plugins: You can Google them! Yoast SEO (free) Note: You’ll want to set up Google Analytics too. Yoast will help you with this or do a quick YouTube search. Secure your Blog – don’t lose all of your hard work! Get your Blog to Convert! Share your blog posts all over the web and allow others to share them as well. Step 8: Get to writing! Keep in mind, your blog will ALWAYS be a work in progress. This is where you need to remember the old saying “Progress over Perfection!” Don’t fall into the trap of paralysis by analysis. It’s always better to throw it out there and clean it up later. You can always edit, change, improve, and tweak. Remember, keep writing! Keep writing on the niche topic that you’ve chosen and be consistent. Pick a day or two a week that you will post a new blog post and commit to it. Consistency IS the key. 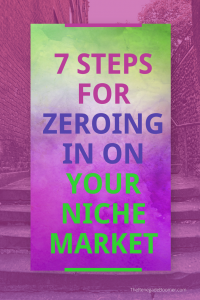 Tina will be teaching you how to zero in on your niche, drive traffic to your blog, create an overarching strategy for your blog, create compelling copy, and most importantly MAKE MONEY from your blog. 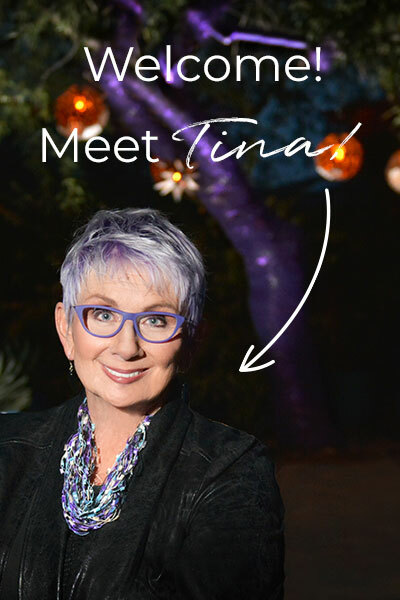 You’re in good hands for ALL of that with Tina!